Why are Dental Cleanings Needed? Dental hygiene is very important for pets. During each physical exam, we do a full oral exam on each patient to determine the state of their oral health and to check for any abnormalities on the teeth or gums. Tartar (calcified bacteria) is visible on the crown, the exposed surface of the tooth, during an exam. However, the same amount of tartar accumulates on the root, which is under the gum line and cannot be seen. This tartar can loosen the periodontal ligament which holds the tooth in place. Additionally, pets may have loss of the bone surrounding the teeth, odontoclastic reorptive lesions (which are similar to cavities), loose teeth, fractured teeth, gum inflammation, or mouth inflammation. Many of these conditions are best viewed and treated under anesthesia, which allows all four sides of each tooth to be evaluated. Tooth surfaces are first cleared of tartar above and below the gum line and then the amount of bone loss is measured with a periodontal probe. The gums, tongue and other soft tissues of the mouth are evaluated while your pet is under anesthesia. Dental prophylaxis are performed using ultrasonic scaling and polishing at our dedicated dentistry table. We use high speed dental drills to make for less traumatic extractions, should they be needed. 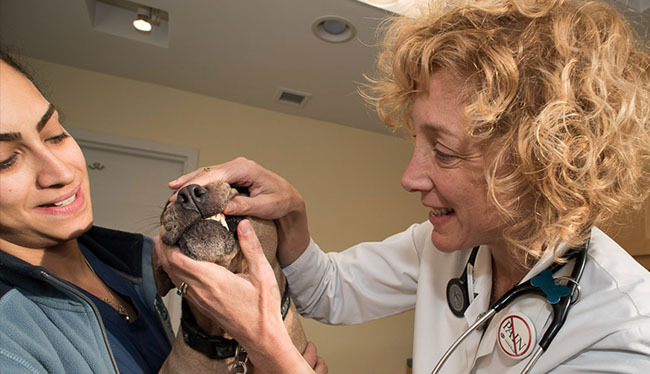 All of our Veterinary Technicians at Katz & Dogs are trained and skilled at performing dental prophylaxis procedures. Dr. Katz performs a thorough oral exam on a patient that is anesthetized. We use an ultrasonic scaler that removes the debris from the teeth and we are then able to polish them so that their surfaces are smooth, which allows less plaque build up in the future. Any extractions that are deemed necessary are performed by Dr. Katz.